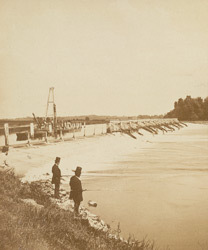 The descriptive letterpress accompanying Russell Sedgfield's photograph of Teddington Weir evokes a feeling for the landscape around this part of the Thames by quoting from Thomas Hood's poem 'The Elm Tree' and Sir Philip Sydney's sonnets. Teddington lock and weir are the uppermost point of the tidal Thames. "The first lock at Teddington was constructed in 1811, the present one in 1857. Below the lock, on the Middlesex shore, is Twickenham and its Eel-pie Island."